1 Rinse asparagus, peel lower thirds, trim ends.Cook asparagus in boiling salted water for about 5 minutes until al dente. Remove asparagus, rinse with cold and drain. Cut diagonally into slices. 2 Rinse and dry strawberries, hull and cut into halves or quarters, depending on size. Halve avocado, pit, cut pulp into cubes. Cut turkey into strips. 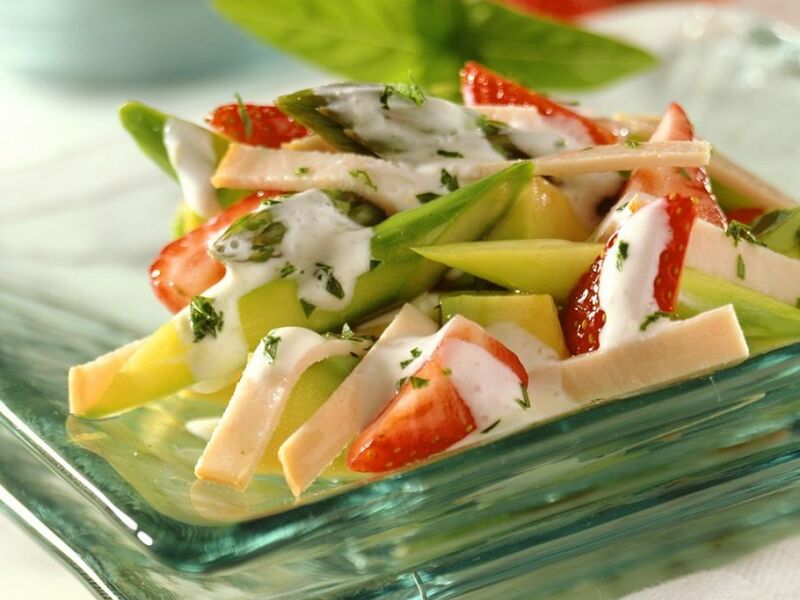 Combine asparagus with strawberries, avocado and turkey, mix well and arrange on plates. 3 Mix sour cream with creme fraiche, lemon juice, basil and honey. Season with salt and pepper. If dressing becomes too thick, add some water. Drizzle dresing over salad, serve.